This sofa brings comfort and traditional design to your living room. 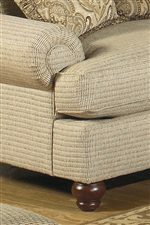 The sofa features three welted box cushion seats with three loose pillow welted back cushions. The sofa is shown with four arm pillows and a kidney pillow. The rolled arms and exposed wood bun feet give this sofa its traditional appeal. The 7970 Traditional Sofa with Exposed Wood Feet by Craftmaster at Miskelly Furniture in the Jackson, Pearl, Madison, Ridgeland, Flowood Mississippi area. Product availability may vary. Contact us for the most current availability on this product. Padding & Ergonomics Premium Cushion (PC): A 6” 2.0 density foam core with a 1-1/2” foam crown patch and a 1-1/2” super soft fiber wrap, encased in a sewn ticking for durability and comfort. Premium cushions are only available on selected styles. 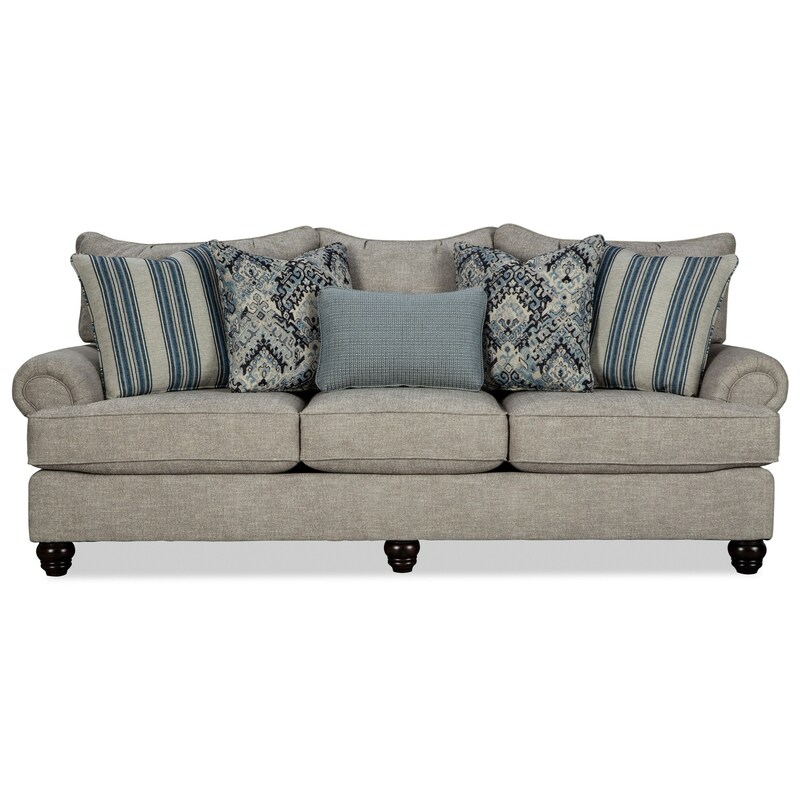 The 7970 group brings a traditional style and comfort to your living room. The group consists of a sofa, loveseat (not shown), chair, and ottoman. The seats feature a welted box cushion with loose welted cushion backs for a comfortable place to sink into. The rolled and welted arms and exposed wood bun feet seen throughout the group really help define the traditional style. The group comes in a variety of upholstered finishes to suit your needs. The 7970 collection is a great option if you are looking for Traditional furniture in the Jackson, Pearl, Madison, Ridgeland, Flowood Mississippi area.